Splash pages, you gotta' love 'em. A blank canvas where the artist can hit the reader with a large dose of illustrated 'wow'. 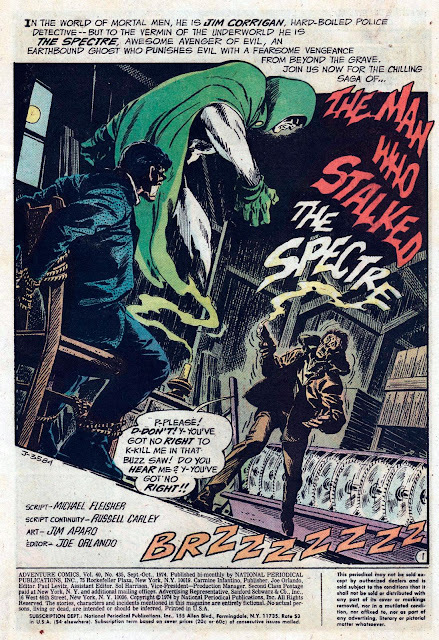 This Friday, as I missed the last installment - a two for one, featuring one of my personal fav's; The Spectre, and the artistry of the man who drew him like few others; Jim Aparo. See? There's something wicked about picking up a comic and seeing a splash-page that has that 'This could be a movie poster' feel to it. Noticed you changed your banner to green characters - very cool. I don't know if you did it for st. patrick's day, but that's the day I noticed it! 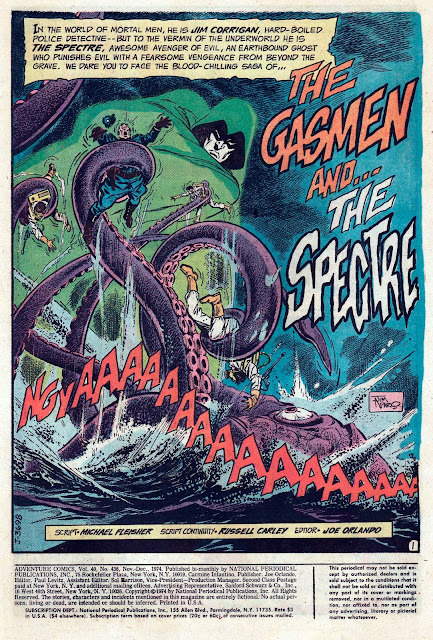 I love Aparo's work. I know him from his BATO run. love the new masthead. I know it's probably temporary, but the green-hued one is my favorite so far. Thanks guys - glad I'm not the only Spectre / Aparo fanatic in these here parts! I agree Rob it was some of his best ever work. And the Green banner gets the big thumbs up does it? At first it was just going to be greenies, then I thought hang-it, let's just stick with the rouges! Thanks to Spidey I sure had enough to fill the gaps. While it was for St Pat's ToB I think I might leave it up for a couple more days. Not sure who will be next? Any ideas Craig? Anyone? In honor of the movies coming out this summer, maybe a nod to each? One for Thor, one for Cap, and then ignore Michael Bay and do a classic Transformers montage. Have no fear Craig - I already have a G1 version ready and waiting!